I read today that Jesse Valadez passed away. Though I never had the chance to meet him, my guess is if I had, I would quickly have known what his passion was… lowriding cars. Jesse was the king of lowriders. 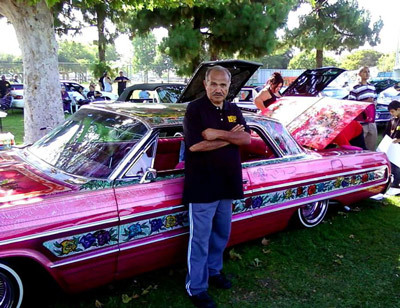 Not a gang member, but instead the founder of a peaceful, civic-minded lowriding club that he started in 1965. His true love was his 1964 Chevy Impala that he named “Gypsy Rose”. Gypsy Rose was hand-painted with multihued roses and a hot-pink interior. The seats swivel in the front and it has a cocktail bar in the back with two small light fixtures. It was clear that his passion touched many people. His funeral service was a true tribute. Friends and fans came from far and wide, sporting their lowrider club shirts and participating in the lowrider car procession that began at St. Alphonsus Catholic Church in East Los Angeles and ended at Rose Hills Memorial Park in Whittier. His prized Gypsy Rose 1964 Impala was at the head of the parade on a flat bed truck and followed the hearse. 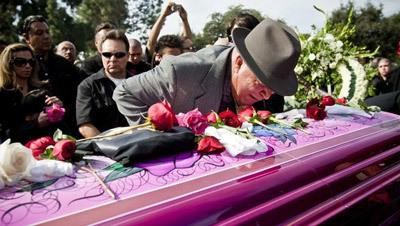 His casket was painted in bright pink with the same roses that adorned his car. Fresh cut roses in pink, white and red were placed on top of his casket. Like many people with a passion, Jesse used his passion to make a living. For many years, he owned an auto upholstery shop in Garden Grove, CA. Jesse Valadez died at 64 on January 29, 2011 of colon cancer in his home in East LA. He bequeathed his “Gypsy Rose” dream car to his son. Perhaps his son can carry on his father’s passion. If you are planning a funeral, perhaps you can make it a celebration of their life if you think about the person’s passions. What sort of tribute would be appropriate to remember and celebrate the person? Show me what a person loves doing and you’ve shown me the person. This entry was posted in Funerals in the News and tagged celebration of life, gypsy rose, Jesse Valadez, low riders, memorial tribute, passion for life, personalize a casket, personalize funeral, tribute. Bookmark the permalink. Jessee is a model for all of us. He found passion in his work and his hobbies/interests. If you think about it, he was never away from his passion because a big reminder sat in is driveway at work and home. And he burned so bright, he attracted others with similar interests into a club. This is how life should be. Living passion in our work and play. Living it 24X7, 365 days a year. And a strong passion can frequently lead you to another passion so your life experience is constantly evolving and growing. Jessee’s passion showed up at his funeral! No one teaches this in life. No one tells us we should seek “PASSION” in our work. Sure we’re told to do what interests us or for which we have an aptitude. That’s settling in my mind. Each of us should shoot much higher and keep this as a constant goal throughout life. Go for it!